Now that the school year has started, engage your kids in quality time in between school schedules by taking inspiration from activities you can learn together on YeY channel’s “Team YeY,” the only local all-kids variety show where kids learn something new every day. Teach your kids the basics of food preparation by involving them in preparing simple snacks like sandwiches, veggie sticks, or simple ulam-and-rice combos. Make it extra fun by arranging food in fun shapes and figures. Try making Monster Burgers, as shown on Snaks Naman of Team YeY. Turn TV bonding into a fun learning experience by tuning in to Team YeY’s StorYeY to revisit classic Philippine literature. Stand by to explain any questions they might have, and turn it into an educational viewing habit. If you’re into arts and crafts, you can make homework into a fun bonding session by getting crafty and creative together. Tune in to Team YeY’s Artstig for kid-friendly ideas. To make rainy days festive, improvise by organizing DIY party games at home with the kids. 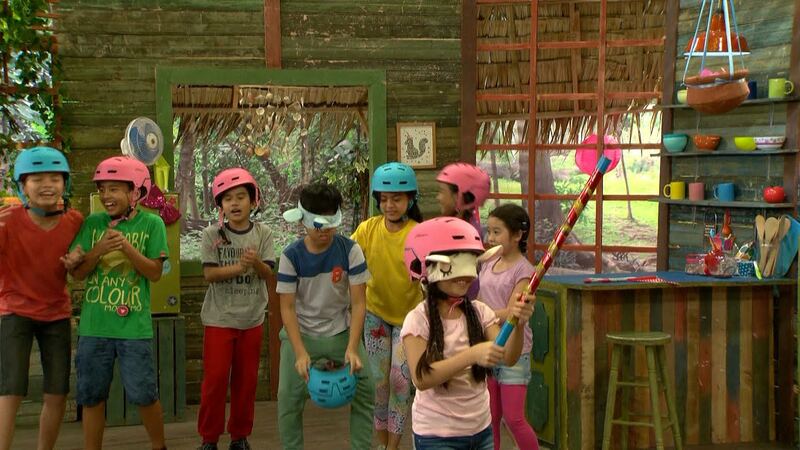 Invite cousins and classmates over on a weekend and engage them in team games as seen on Team YeY’s Sunday Funday and Game Play. Take a short break by jamming with your kids while watching Team YeY’s Soundcheck. This will also give you an opportunity to see and experience what your kids are into these days. Try teaching them your favorite songs, too—they’ll enjoy learning “old” songs from you too! You don’t need a Zumba class to get exercise—just dance with the kids and have some laughs as you attempt to follow the dance along to Team YeY’s Galaw Go segment. Set aside a little time each day to play and learn with them, and tune in to Team YeY daily day of the week at 8:30 am and 2:30 pm. Team YeY airs on YeY channel exclusively on TVplus, with catch up episodes on iWant TV. “Team Yey” brings the fun and learning all week long with its daily themed segments. Galaw Go!, is led by AJ Urquia and Nhikzy Calma; Snacks Naman by Mitch Naco and Sophie Reola; Artstig by Jana Agoncillo and Althea Guanzon; Game Play by Sam Shoaf and JM Canlas, StorYey by Raven Cajuguiran and Yesha Camile; Sound Check by Luke Alford and Noel Comia Jr.; and Sunday Funday with all the hosts. YeY is a free and exclusive channel on digital TV via ABS-CBN TVPlus, which you can get for a one-time payment of P1499. ABS-CBN TVplus signal coverage is available in Metro Cebu, Cagayan De Oro, Iloilo, Bacolod, Davao, Metro Manila, Bulacan, Nueva Ecija, Pangasinan, Rizal, Laguna, Pampanga, Tarlac, Benguet, and Cavite. Yey is also available on cable via SKYcable and Destiny Cable and on direct-to-home or satellite TV via SKYdirect. For more information, visit tvplus.abs-cbn.com and follow ABS-CBN TVplus and Yey on Facebook. You can also subscribe to YeY’s YouTube channel for your daily dose of YeY.